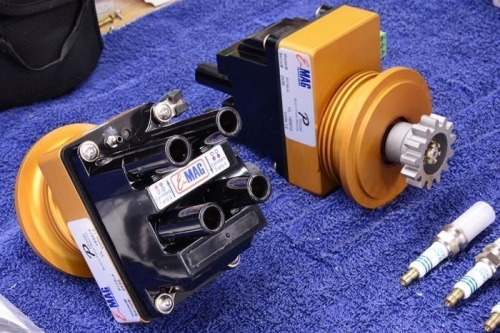 As a part of the RV-8 rebuild, I decided to upgrade the standard Slick mags on the Lycoming IO-390 to new EMag Electronic Ignition units called PMags. 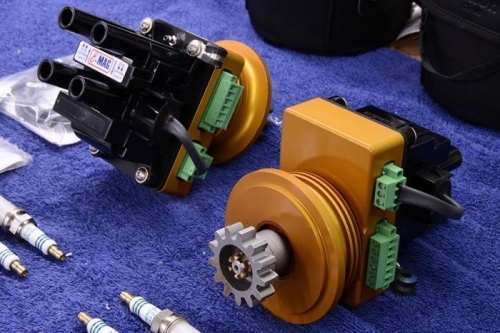 These units fit right into the same engine accessory case holes as the Slick Mags did, but they are 100% electronic and generate a much hotter spark. 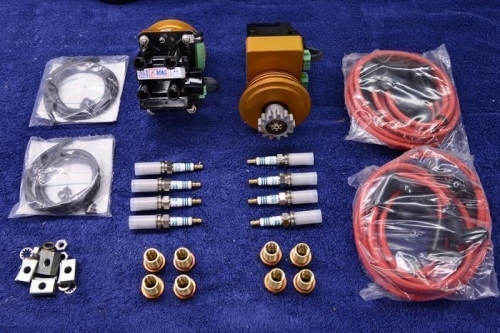 Additionally, they also include their own internal alternator that generates enough electricity to run themselves when the engine RPM is over about 900 rpm. You still have to have battery power to start the engine, however. In case the battery is dead and I still need to start the engine, I included a DB9 connector and a switch next to the two DB9 RS232 serial data connections on the internal bulkhead. With the connector and switch, I can connect and external battery to the DB9, flip the switch down, and then hand prop the engine to get it started. Once the engine is running, I can flip the switch back into the UP position and fly home. The PMags can use standard automotive spark plugs which is a significant cost savings. The auto plugs are smaller in diameter than the standard aircraft spark plug, so you have use these special sleeves to install the plugs into the engine. All that went fine with no issues. Timing the PMags is a LOT easier than regular mags. You just set the propeller in the TC (top center) position using the key hole on the starter aligned with the TC mark on the starter ring, power up the PMags with the Mag Switch in the Off position, blow into the manifold pressure port that each mag has, wait for the Red LED to start flashing, blow into the port a second time, and the LED will blink Green, and you're done. It's really just that simple. Best of all, you can time BOTH PMags at the same time, so you know they are perfectly synchronized. Pretty awesome.